Situated down a small track Moo (lane) in Mae Nam, Wittaya Muay Thai, is an old school style training facility. There are no distractions of the beach or bars and boom boom music, just a small local community of houses and the gym. Wittaya Muay Thai is a family style training camp, anyone is welcome to come and train, from complete novice to professional camp fight preparation. Everyone gets the same personalized attention from professional Muay Thai fighters, all of whom fight on a regular basis and have won and challenged for professional honours. Coming to train at a Muay Thai boxing gym can sometimes be a little intimidating for novices or those that want to learn for the first time. Some are put off by the idea, at Wittaya Muay Thai you are made to feel welcome, the atmosphere is relaxed and friendly, everyone is treated with the same respect no matter what skill level, age or gender. Now retired professional, owner and head trainer Khun Wit, had his first Muay Thai fight at the age of 9, becoming professional at 16. A Surat Thani Champion who spent many years being trained by one of Bangkok's most famous coaches, Khun Kim You. Khun Wit has now trained many champion fighters from all corners of the globe, he is highly regarded and known in the Muay Thai profession, students travel from Europe, Australia and other parts of the world to train and prepare for fights under his guidance. The current professional fighters who train students include; Jack - a Samui and Malaysian Champion, Teeiapong one of Thailand's top contenders, Salatan a former World Muay Thai Council Champion and Taphet one of Southern Thailand's top fighters. Muay Thai is a serious sport, but just like everything in Thailand, it should be Sanuk (fun). That's the way it is done at Wittaya Muay Thai. 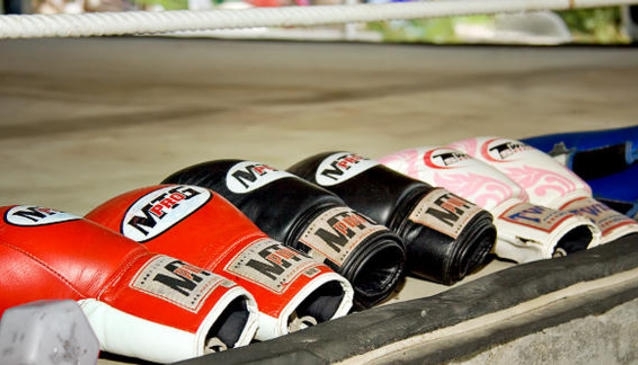 This gym is not just for those that are or want to become fighters; Muay Thai is a great form of self-defence, great for fitness or losing weight. It is also a fun way to let off some steam, while learning a new skill. Warm, friendly atmosphere, no fancy equipment or facilities, it's about the people, sharing, caring and teaching in traditional Thai style.